The one-volume LexisNexis AnswerGuide: New York Criminal Procedure provides direct, New York-specific answers to questions that arise in day-to-day practice. It covers important topics related to criminal procedure, including all aspects of the preparation for the defense or prosecution of a criminal case. Authored by Barry Kamins, Esq., and Warren J. Murray, Esq., LexisNexis AnswerGuide: New York Criminal Procedure provides direct, New York-specific answers to questions that arise in day-to-day criminal law practice. 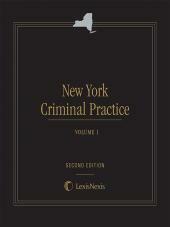 It offers valuable insights prepared by the subject matter experts and active NY practitioners for dedicated Criminal defense lawyers, prosecutors, trial lawyers, civil practitioners, new associates and paralegals. It covers important topics related to criminal court proceedings, including initial defense and prosecution strategies, criminal court jurisdiction, arraignment, bail, grand jury issues, discovery, admission of evidence, sentencing and pre and post-trial motions and hearings. It includes over 60 detailed, task-oriented checklists and more than 200 practice pointers (Warning, Strategic Point, Exception, Timing, Practice Resources) to ensure best practices and avoidance of potential practice pitfalls. 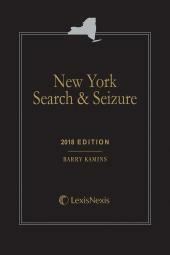 Warren J. Murray, an assistant district attorney in New York County, is the bureau chief of Trial Bureau 50 in the New York County District Attorney's Office. He has been bureau chief for the last 25 years, and currently supervises over 40 lawyers and 15 support staffers. Mr. Murray is also an adjunct professor at Pace University Law School. He frequently lectures on prosecution matters for New York County and other law enforcement groups. Mr. Murray was awarded the Sloan Public Service Award in 2001 by the Fund for the City of New York for outstanding public service. He has authored many articles about the prosecution of criminal cases.